MINI Singapore - MINI Connected. 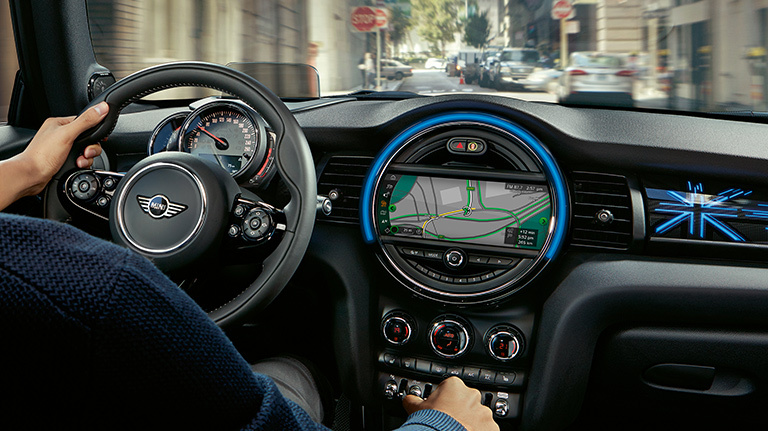 Take a closer look at how MINI Connected gets you closer to your MINI - and the world around you. Driving is always most enjoyable when you have a personal travel planning app looking over your schedule, making sure you always arrive on time. Well, it's now here – and here's how. MINI Connected gets to know your driving patterns. You synchronise it with your calendar, so all your appointments are integrated and your MINI can give you directions before you set off. It also sends your phone or Apple Watch reminders when you have to leave to arrive on time – taking real-time traffic data into account. All the remote functions can be easily activated from the MINI Connected app. What could be better? 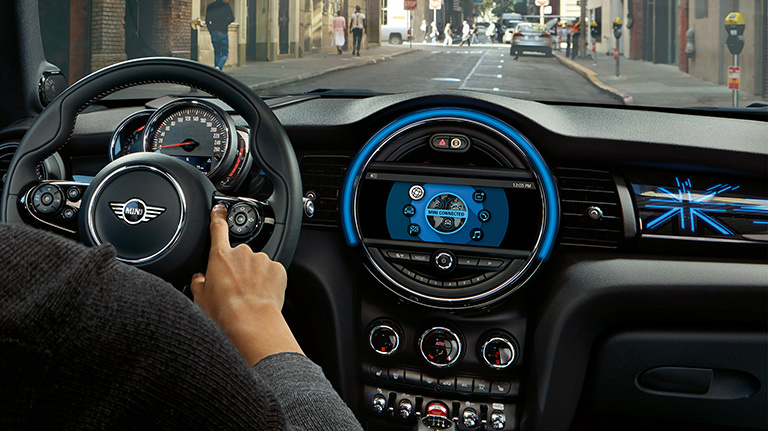 Avoid delays with Real-Time Traffic Information (RTTI) thanks to MINI Connected and its navigation system. It alerts you about accidents, traffic jams and roadworks ahead. Connect with everything that's important to you. Enjoy a whole host of intelligent services and vehicle apps that provide you with information and entertainment throughout your journey. When you want to fill your tank up, MINI vehicle apps not only find petrol stations on your route, but also let you compare fuel prices to help you keep costs down. You'll also get up-to-date weather forecasts – and as you approach your destination, they'll show you where parking is available and direct you via the navigation system to your preferred car park. 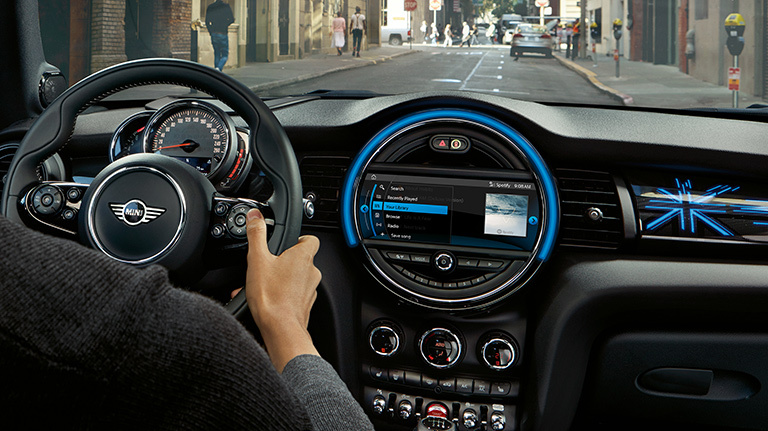 MINI and Spotify give you access to all the music you’ll ever need via your MINI sound system. Just connect the free Spotify iPhone® app to your MINI Connected system, and enjoy 30 million songs as well as Spotify radio. You can make your own playlists too, so that you now have the perfect music for any journey. Control your Spotify music completely through MINI Connected and avoid the distraction of your phone. 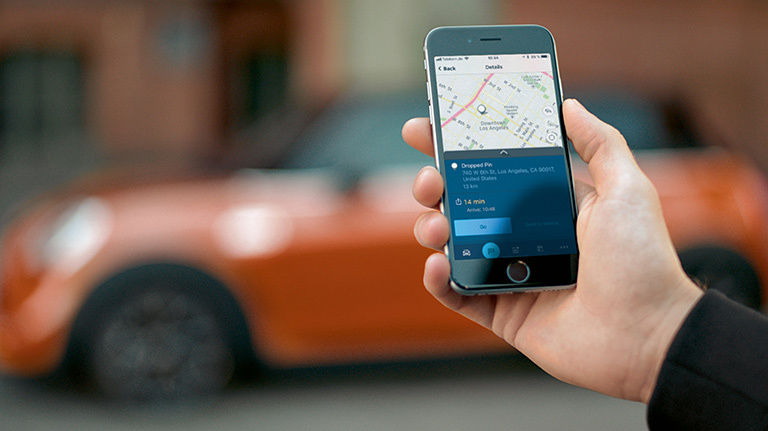 Your smartphone and your MINI become one with the MINI Connected app. Imagine you’re heading off somewhere but you’ve got to buy a couple of things en route. Destinations and places that you have found on the web or using apps such as Apple Maps and Google Maps can be seamlessly and conveniently transferred to your MINI with the send-to-car facility. Just one click and you can conveniently import a selected destination – like a shop – in your MINI Connected navigation system. 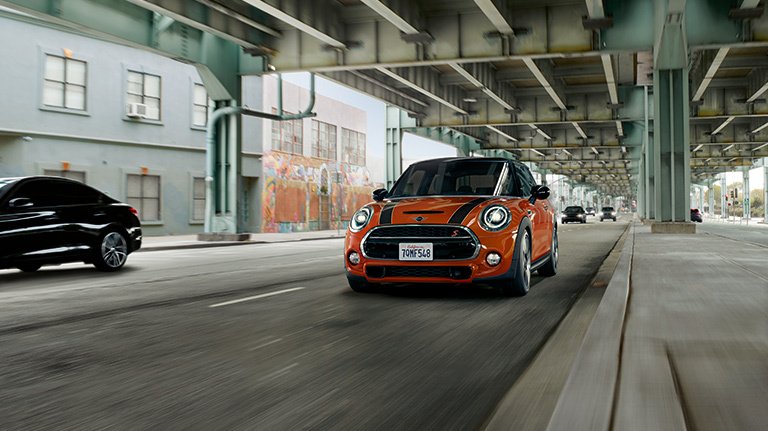 Speak to your MINI in your natural speaking voice. The Natural Language Understanding has a processing speed of just a few seconds and can recognise your normal voice. So you can interact with your MINI with your voice – and interrupt it if you wish. You can even ask it to do things like: "show me the fastest way home." It's the perfect way to control many of your phone’s functions, so you can keep your hands on the wheel and eyes safely on the road. 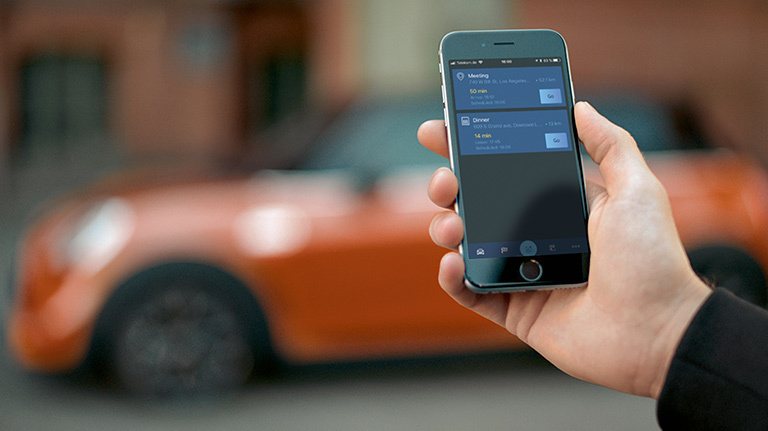 Remote Services save you the inconvenience of a long search for your MINI as you can control it from a distance, making finding your vehicle a whole lot easier. Its location can be indicated by sounding the horn or flashing the lights – or via a map on your smartphone. But you can do a lot more than that. 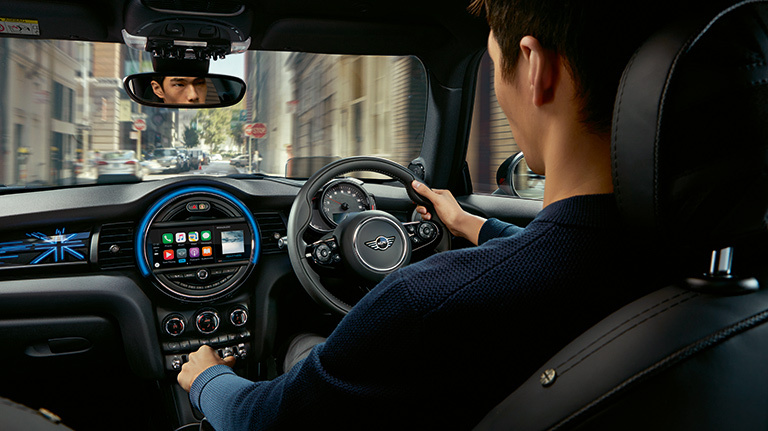 It lets you control various functions on your MINI from a distance as you have all the information conveniently in one place in the MINI Connected app. For example, you can access the status of the windows and doors, unlock and lock your door – or you can operate the air ventilation well before you get inside. If you’re unable to call for help in an accident, it’s good to know MINI can. With the optional intelligent Emergency Call system, your MINI automatically sends a distress call to the BMW Group Call Centre with key data from your car, including your exact location, type of collision, status of the airbags and front seat belts, so help can swiftly arrive. The Apple CarPlay makes it easy for you to interconnect your iPhone with the display, the controls and the speakers of your MINI. So you can control the main functions of your iPhone using your MINI’s controls or Siri voice control. With CarPlay, you have many apps that you use on your iPhone at your disposal in-car. You can conduct phone calls, listen to music, call-up route descriptions, have incoming text messages read out, and send your own text messages, and much more. Enjoy life in the mobile fast lane. Get the latest versions of all necessary software for using your mobile devices in your MINI − and a whole load of other great downloads too. All for free. Interested in MINI Connected? Call us at 6473 3777 or leave us your details and we will contact you at the soonest possible.